Despite the Tall Ship events and 4th of July, energy at Frost Park seems to be growing. Though, this week looks to be a bit different. There are two awesome banners created for Friday's Frost Park events. RR Anderson's message to Tacomans. to FUNCTION absent FEUDAL AUTHORITY. WE THE NOBEL CHALK ARTISTS . . .
by Adam the Alien on 7/4/2008 @ 3:45am By the way, I didn't get the chance to mention it yet, but if anyone found themselves missing something after last week, talk to me - I may have it. I waited a while after everyone left and picked up the remains when it looked like no one was coming back. And on that note, remember to pick up after yourselves, folks. I know it's easy to forget things in the end-of-lunch-hour-chaos, but your orphaned items - be they disposable or valued - would appreciate some love. Let us not forget that the gritty reality of the sidewalk's world does tend to filter back into Frost Park after we depart, leaving whatever is left behind in a vulnerable state. by KevinFreitas on 7/4/2008 @ 8:23am I'm bringing some tasty local treats to share. Looking forward to seeing everyone! by Erik on 7/4/2008 @ 10:03am I'm bringing some tasty local treats to share. Looking forward to seeing everyone! by Erik on 7/4/2008 @ 10:21am BTW, the Volcano via Daniel Blue picked up on Frost Park, RR and myself at Blackwater in The Tacoma Files. Erik Bjornson is surprisingly not the son of Bjorn. by kathy on 7/4/2008 @ 12:13pm Andrea...the battle art is GREAT!!! We'll have to get one of those for Katie's room. Sorry we are not there at Frost Park today...had a bout with some stomach bug, on the mend but still shaky..
Hope to see you on Wednesday!! by NineInchNachos on 7/4/2008 @ 2:24pm here's my batch. there are a bunch so it might be slow loading. enjoy! 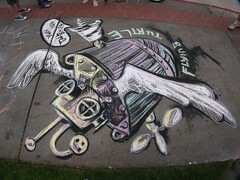 by Erik on 7/4/2008 @ 2:39pm It was tough to miss another Frost Park Chalk Off. Looks like some good work though. The colors really stand out well this week with charcoal being used in such abundance. The black certainly helps them take better pictures and now generous amounts of charcoal looks to be pretty standard practice. The Feed Tacoma sign on the vertical panel is a good addition for passerbys to get connected to Feed Tacoma and the art pieces. And a few of the individual ones. I have to give props to Tacomite for taking all of my photos for me. Thanks babe! by Adam the Alien on 7/4/2008 @ 3:12pm Didn't chalk today because asthma + being sick + chalk dust = COUGHHACKWHEEEEEEEEEZE! 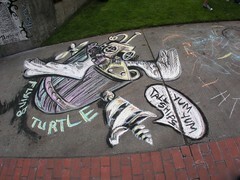 I did, however, have loads of fun hanging out with people, talking, and just watching the chalkers. A family was on its way downhill, presumably to Tall Ships. As they passed through the park, a young, wide-eyed lad pointed at her drawing and loudly proclaimed, "Mommy! Look at THAT!" Still deciding on who my vote's for...despite the smaller amount of chalkers than in recent weeks, the ante has certainly been upped yet again. by NineInchNachos on 7/4/2008 @ 3:18pm anybody know the dude who does the black art deco tile squares? they're killer. "The number of chalkers was staggering." by Elle on 7/4/2008 @ 3:25pm anybody know the dude who does the black art deco tile squares? they're killer. dunno myself, but Andrea might. She rushed out in a hurry with him. by Dianne on 7/4/2008 @ 3:35pm I vote for Jeremy and Garfield. Garfield is looking very festive today. by Erik on 7/4/2008 @ 4:11pm Andrea's piece shows how 4th of July will look tonight at Fireman's park. One of my favorite Elle pieces mixing patriotism with a self portrait. RR would be proud. Its in the top two IMO. Stowe's Gnome piece looks scary. The gnome also looks to be melting like on Stowe's fashion trading card. Other good entries too most notably the dog. RR Anderson's piece I think takes the day though. Its just so good and far past simply sketching Tacomics on the sidewalk. I vote for RR Anderson's one person flying turtle submarine machine. by tacomachickadee on 7/4/2008 @ 4:17pm I vote for little chickadee's sun (the one with blush) ... and my little fun with (the other) sun was more about the words: "WHO NEEDS SUN WHEN YOU HAVE CHALK." Just having some fun since the kids were being good. by joel413 on 7/4/2008 @ 4:31pm It's my civic duty! by Erik on 7/4/2008 @ 5:21pm anybody know the dude who does the black art deco tile squares? they're killer. Is this the guy and the art? I don't see any other photos of it. by NineInchNachos on 7/4/2008 @ 5:25pm that's the guy! N00b? It's OK for me to vote on this Fab 4th even though I'm British, right? by KevinFreitas on 7/4/2008 @ 5:42pm I gotta for for Ariel's piece. Made me genuinely hungry. Love Stowe's twisted take on his previous snake. Elle, as always, beautiful color and self-promotion. I loved Chickadee's work but I hear it was lifted from something one of her offspring was doing. Thanks to Dave L for the touching tribute. Everyone, great stuff! by Amanda D. on 7/4/2008 @ 5:43pm I'm glad I took a picture that someone actually wanted to see. It was hidden in the corner, so I can understand why it wouldn't have been included. The artist just wandered off when he was done; or, at least, I never saw him again. And my vote goes for little Stowe, because he came up to me and whispered so nicely that he wanted me to vote for him. He even said, "please." I'm a sucker for well mannered children. by mzkrug on 7/4/2008 @ 5:43pm I'm voting for Jeremy's festively patriotic Garfield! by Mark Monlux on 7/4/2008 @ 5:50pm I'm voting for Elle. Because it is my civic duty. Yeah. by justagirl on 7/4/2008 @ 6:04pm Elle! by Elle on 7/4/2008 @ 6:17pm I was highly impressed with the abundance of youngling art this week. Even my boy got in on the action until I so rudely drew over it. Stowe, beautiful as always. Andrea, your art always looks so different in photos than in person. I love the contrast. Ariel, yours was a drawing after my own heart. But the sidewalk told me to I will vote for myself. by TacomaGnome on 7/4/2008 @ 6:25pm Though the snake was quite tasty, thank you Stowe, I understand the quote reference is to some sort of "Science Fiction" series of movies. So, good cultural reference. I am quite impressed with Elle's work. My vote goes for her. by scrapsandsass on 7/4/2008 @ 6:44pm I have to vote for RR's masterpiece. Impressive. The kid art is always fun. 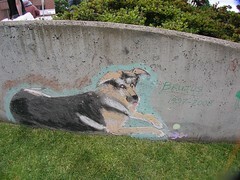 Dave's Dog Memorial was heart felt and rendered in such a way as to create the illusion of the dog's eyes following you from every vantage point. Jeremy continues to excel with his Garfield metaphor. The Yankee-privateer use of copyrighted material is outstandingly appropriate for our date (July 4th the day we declare ourselves free from the tyrannical boot of oppression). Excelsior! Tacoma Boys... my favorite 24hr produce store. It is good to see them get some love at our event. My vote however must be cast for great FLYING TURTLE of 1776, a creation whose life mission of tormenting tallships is something I hold close to my fiery heart. by Tacomite on 7/4/2008 @ 9:09pm My vote goes to Elle this week. 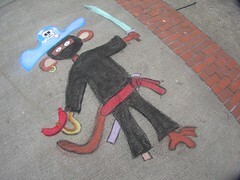 I give a strong honorable mention to the Ninja Monkey Pirate and Stowe's snake eating Gnome. by jenyum on 7/4/2008 @ 9:27pm I was impressed by the art this week, as usual. I loved Andrea's tribute to fireman's park, the flying turtle, the Tacoma Boys tribute, Stowe's continuing mastery of the running in-joke. I would vote for Elle, as it is my civic duty and I enjoy her reference to her super-hero self. However, Little Stowe asked me very politely to vote for him, and I am simply blown away by his presence as an artist, his dedication and his positive visualization, as he chalked with bold strokes announcing: I WILL win the chalk off!! by Amanda D. on 7/4/2008 @ 9:41pm I'm pleased that someone else fell to Little Stowe's charms, Jen. He's a great artist and a sweet little boy. by jamesstoweart on 7/4/2008 @ 10:04pm I'd like to vote for my son too. His exuberance was very infectious... He made up for my tired listlessness. And Barrett with a British title would be awesome. Little Lord Barrett, Junior Earl of Stowestershire! by Courtney on 7/4/2008 @ 10:17pm Thanks to Tacomachickadee and Kevin for the tasty treats! They were yummy. I should vote for my son because he is such an awesome little guy. He stayed pretty busy with the chalk today which is a little unusual. But my vote is for the RR's flying turtle. I love turtles. by Lance Kagey on 7/4/2008 @ 11:00pm Ask and ye shall receive. I vote for RR. by scout on 7/4/2008 @ 11:05pm The turtle is supreme - multi-angled, sophisticated, intricately dimensional, and menacingly predatory as it devours the quaint and perpetually historical Tall Ship petits fours innocently floating with no idea of what lies in store! My vote can only be for the Turtle, flying in the face of those who stand in the way of the march toward independence and freedom. 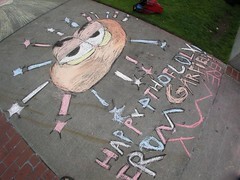 by JeremyScott on 7/4/2008 @ 11:32pm I vote for 4th of July Garfield. by kathy on 7/4/2008 @ 11:34pm My vote goes to Barrett. Nice work buddy-bear! 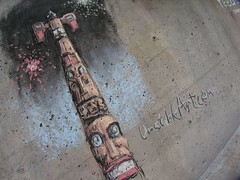 Andrea, loved your totem pole...beautifully rendered as always. Ariel, loved your watermelons...very 4th of July! 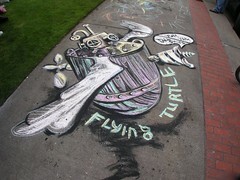 RR, also loved your flying turtle! Nice job by everyone once again. Team Anderson will be back next week! by AngelaJossy on 7/5/2008 @ 12:16am Flying turtle! by Erik on 7/5/2008 @ 12:18am Ok. I have counted them twice. Elle has had a heck of a dry streak at Frost Park. The last time she won was in Episode III ten Episodes ago. Was she discouraged? Absolutely, but she kept plugging away. I like her submission this week. It combined over the top self promotion with patriotism in sort of a Stephen Colbert genre. Want to know how Elle thinks and how she plans for her challenges at Frost Park? Here's her web page where you can follow her life adventure one step at a time. Similar to RR Anderson, she lives her life in a "meta" way showing much of it on the internet. by Thorax on 7/5/2008 @ 12:57am No one ever votes for me... I gotta start getting home early enough to vote! +1 for Thorax, though it be too late. by tacomachickadee on 7/5/2008 @ 2:15am For the record, "Little Chickadee" is my daughter. The Boy was too busy running around the park with his buddy to chalk. He does not feel obliged to chalk every week. The Eldest, aka "Little Chickadee", has been itching to chalk for months, so now that school is out, she's ALL OVER IT! Congrats everyone today! We enjoyed our Chalk-Off II later that day, in which Elle and her hubby both drew masterpieces along with a handful of others, which were then photographed bye our very awed neighbor. Awesome! by NineInchNachos on 7/5/2008 @ 8:32am Nice work team. Congratulations Elle. May the sun never set on your flag. I'll be out again next week, but will return for #15 in a team-up with Tacomite. by Adam the Alien on 7/5/2008 @ 5:09pm Oh my God. I got so caught up with festivities and sleep-deprived video chatting last night that I totally forgot to vote. Oh well, things seem to have turned out in favor of one of my favorites, anyhow. Huzzah, Elle! Friend of the Weekly Volcano/Spew, Tacoma Mama sent us a few snapshots of the Frost Park Chalk Challenge 13 held July 4, 2008 in downtown Tacoma. Looks like I missed RR Anderson's fashionable outfit. RxR's Flying Turtle is a grand-slam home run, combining history and technology to fight off those pesky ships that have invaded Tacoma, with each mast and spar across the moon like a prison bar. Very relevant, and brilliant execution. (Perhaps RxR's first use of a submersible?) Andrea's Fireman's Park is simply perfect.